Today is an exciting day! Urban Decay is releasing a new line of super shiny, super plush lip glosses. And I've got reviews and swatches of two of the new shades! When Urban Decay's website launched in Canada in 2016, I immediately signed up to become an Urban Decay Beauty Junkie. I truly am an UD Beauty Junkie... I love Urban Decay products and I wish I could own them all. Last week, I received this surprise package on my doorstep and much to my delight I found two of the new Urban Decay Hi-Fi Shine Ultra Cushion Lip Glosses inside. I received the shades Candy Flip and Obsessed. I screamed and danced around because best makeup mail ever! The Hi-Fi Shine Ultra Cushion Lipgloss is ultra-shiny, glides on cushiony-soft and provides long-lasting wear that’s comfortable, not tacky. Laced with vitamin E and peppermint oil, the hydrating formula leaves lips feeling nourished, has an immediate plumping effect and comes in a yummy vanilla-mint flavor. I am super into the tingly, plumping effect! I so really love the applicator.. it's doe-foot and really easy to use. What strikes me most about these lip glosses is how hydrating they are! Forget lip balm, I'm using the Hi-Fi Shine glosses from now on. Seriously... these are amazing. 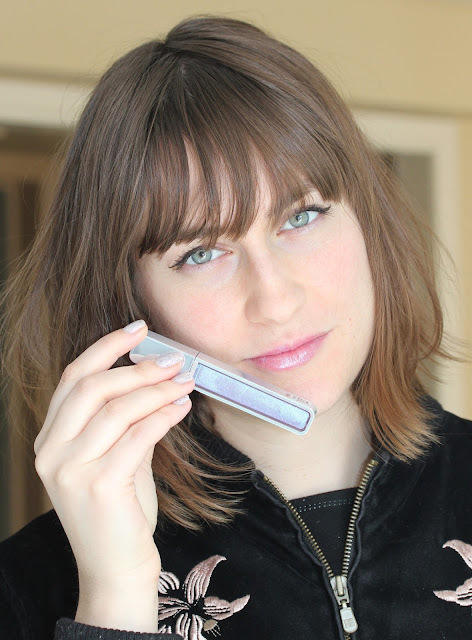 Urban Decay Hi-Fi Shine Ultra Cushion Lip Gloss will retail for $23 CAD on UrbanDecay.ca (March 15, 2018) and Sephora Canada (March 29, 2018). Above I am wearing Urban Decay Hi-Fi Shine Ultra Cushion Lip Gloss in Candy Flip, a holographic lavender with blue-pink sparkle. This is lovely and the sparkle really shows on the lips and in certain lighting you can really see the holographic quality to it. Above I am wearing Urban Decay Hi-Fi Shine Ultra Cushion Lip Gloss in Obsessed, a baby pink cream. I have been wearing this all the time because it's easy and effortless and tingly and minty! If you are planning to buy any of the new Hi-Fi Shine glosses, consider using my affiliate code so that I can get UD Junkie points (and you will too). Also, be sure to sign up for the UD Junkie program so you can refer friends and earn exclusive perks and samples.